When a representational artist attempts to paint a realistic picture (as opposed to an abstract work), what they are really attempting to do is to recreate the 3-dimensional world on a 2-dimensional surface (canvas). Through the combination of many visual clues such as overlapping larger closer objects in front of smaller more distant objects, through perspective, shading, modeling and atmospheric perspective (blurring and less contrast in the color and tone of more distant objects) the illusion of our real world visual cues is replicated on a 2-dimensional plane. This painting "deconstructs" or has images within the painting which somewhat violently attacks the illusion of reality. The hand in the center tears up the edge of the canvas, exposing the wooden stretcher beneath. 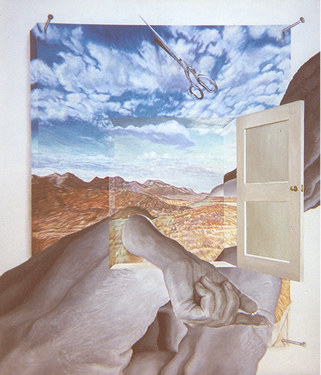 Nails enter at the 3 exposed corners, a pair of scissors is impaled into the top of the canvas and a door opens into a doorway right in the center of the painting.